Great way to get some veggies while still having a cool and crisp meal. 1. 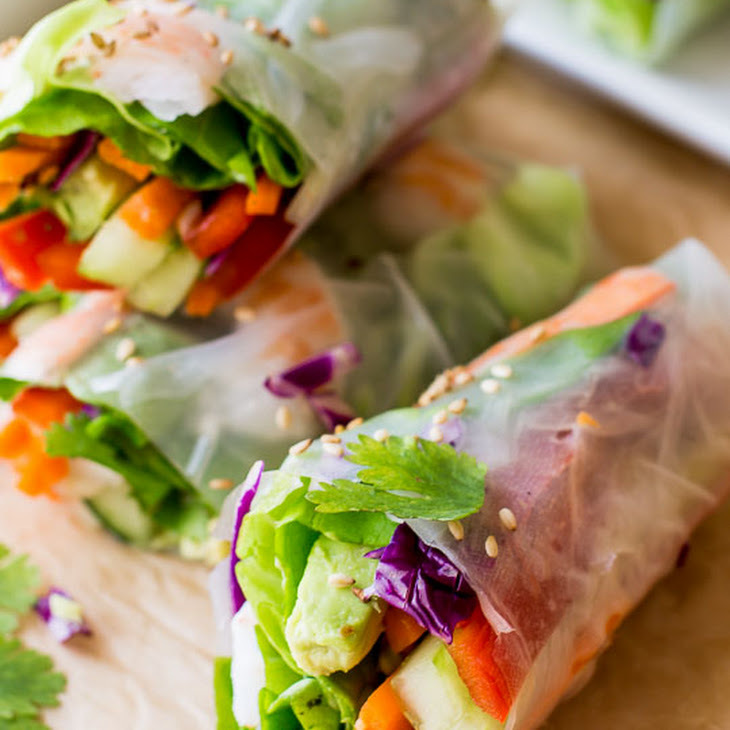 First, read through the post above to learn some tips/tricks for making these summer rolls. Also, make sure every single ingredient in the summer rolls is prepared/chopped/cooked before you assembling. 2. Prepare the dipping sauce: You can whisk everything together in a bowl or use a food processor. Sally prefers whisk them because it saves her from cleaning the food processor. Add everything to a medium bowl (except water and optional garnish) and whisk until smooth. Add 1-2 Tablespoons of warm water or until you reach desired thinness. Pour into a serving bowl/ramekin and top with garnish. Set aside. 3. Prepare the rice paper wrappers: Pour warm water into a large bowl or 9-inch square or round baking pan. The baking pan is what is generally used. Working with one at a time, dip the rice paper wrapper into the warm water for 15-20 seconds (or whatever the package suggests). Usually it’s around that time. You want the wrapper to be soft, yet still slightly firm and pliable. Immediately remove from the water and place flat onto a work surface such as a large plastic or ceramic cutting board. You can use a large wood cutting board, but the wrappers stick to it a little more. Pat the wrapper slightly dry. 4. Fill the rolls: Place a few sticks of carrot, cucumber, red pepper, and a sprinkle of cabbage on top of the bottom 1/3 of the rice paper as explained and pictured in the post. Then, a small amount of noodles (if using), a slice or two of avocado and a bit of cilantro. Lay 1/2 of a lettuce leaf on top and 4 slices of shrimp on top– as pictured above. Remember, do not overstuff the roll. Start small then add more, as needed, as you roll each one. 5. Roll them: Roll everything up tightly. To do so, gently pull up the bottom of the roll and roll over the filling. Then, roll and use your hands to tuck the filling in as you go. It’s basically like you’re rolling a burrito! Remember, you want a very tight roll. You can fold in the sides of the rice paper roll if you wish, but it’s not necessary. 6. After rolling each, place on a serving plate. Cut in half, sprinkle with sesame seeds, and serve with peanut sauce. 7. Make ahead tip/storing: Wrap rolls individually in plastic wrap (suggested to prevent sticking and then tearing) and layer in a tupperware between sheets of parchment or wax paper. Store up to 2-3 days. In terms of taste, the rolls are best served fresh the day they are made. Cover sauce tightly and store in the refrigerator for a couple days.